Soldier Trucking is a trucking company that has been serving the Midwest since 2006. With both regional and national routes, Soldier Trucking has job opportunities for many different people. As a family-owned company, they work together to provide a safe work environment for those who work for Soldier Trucking, and for those who share the road for their drivers. 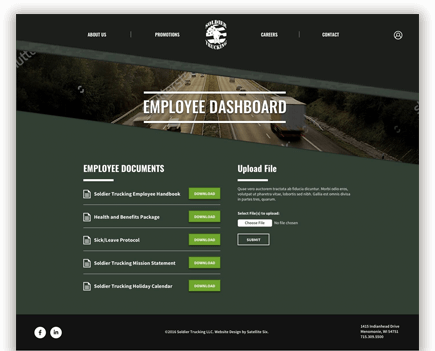 Trucking is a competitive market, especially for appealing to prospective new hires, and Soldier Trucking wanted to create a modern website that appeals to new hires. They wanted to clearly display their truck routes via interactive map, as well as clearly present the benefits that they offer, which many trucking companies don’t provide. The ultimate goal was to stand out from the competition in bringing new hires into the company. 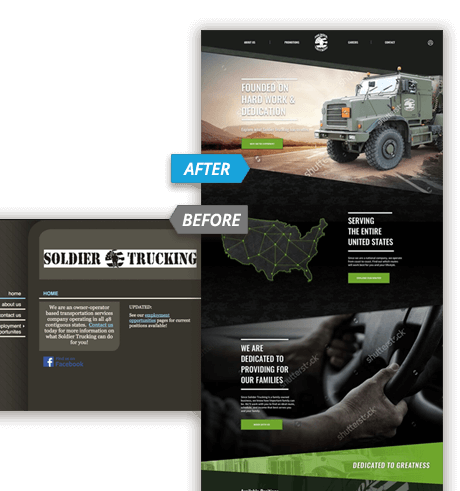 More than just a facelift, the Soldier Trucking website was planned to thread visitors to specific resources and drive prospective new hire interest. While keeping the military-focused, family-owned aesthetics intact, our team helped clearly communicate the benefits of working with Soldier Trucking, as well as created a unique interactive map to display their truck routes in a stylized way. As a central location to store employee and managerial documents, an employee login portal was developed to ensure that all on-the-go truck drivers have an easily accessible way to view important documents related to their business or employment. For Soldier Trucking, this served as a competitive advantage, allowing them to better communicate with and provide resources to their trucking team. Soldier Trucking is an active partner with Satellite Six for continued operation and website growth. This allows the Soldier Trucking team to focus on their employees and their company as a whole to ensure it continues to be a great place to work, while our team ensures the continued performance of their website and marketing.